Janet, Kristin and Katie have given us lots of tips and inspiration for scrapping events, like birthdays. But when it comes down to it, a lot of the challenge for me is the photos. 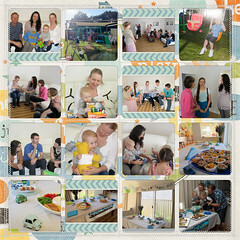 I am fortunate to have a number of people in our family taking and sharing photos at family events, and it can be a challenge to collate and select the best and most meaningful ones for my layouts. manage my photos, and when I have an event with dozens of photos to sift through I love the simplicity it brings to the process. Today, I’ll walk you through the process I used to collect all my photos into one easy to handle place. The first step is to round up all your photos. I go into this step in detail as part of the Get Organized: Photos class, but here’s an outline of how you can manage photos from all the various devices. You can use the import feature to import your photos from where ever they are currently located on your computer or to download them from a Camera or Card Reader. On Windows, Organizer can watch folders for new photos (or scrapbooking supplies!) and automatically import them. So I use that feature to my advantage and set up one home base folder and have all my photos stored there. If you are using a Mac, simply drag the new folder of photos onto the Organizer window to prompt it to import your folders, or you can import feature. Eye-fi memory card to automatically upload my photos to my computer, and file them in monthly folders. Thanks to watched folders, Organizer imports them the next time I opened it up. I don’t even have to think about it and I never run out of space on my memory card. What a relief! Camera Upload feature to sync photos Dropbox and any computer linked to your Dropbox account. Again, I rely the watched folders to pull in my Dropbox Camera Uploads. watched folder location on my computer and Organizer imported them the next time I opened it up. I’ll then add details to the stack of photos there, by clicking Name Events. To see all the photos from all the different cameras snapping photos on that day, just double click on the event stack. Where you go from here is up to you. 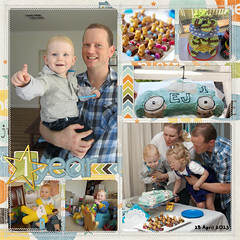 My process with a party page is to grab one photo I love of the birthday boy (or girl!) and then include a sampling of photos of the guests and party decor. When you browse throughout your photos you can easily mark your best photos with a star rating. Just type 1-5 on the keyboard when you have that photo selected. Easy! To find all your five star photos, just click on the stars at the top of the Organizer window. It will instantly filter your photos. I don’t star rate every photo, I’ll add a 1-3 star (type 0 to remove a star rating from your photo). I came up with these few shots as my best. 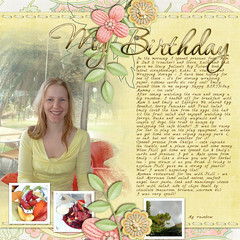 For birthdays, templates make the final scrapping easy. Add papers and embellish with a kit or two. 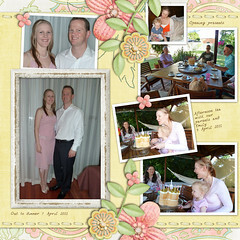 You could easily make your own design, to work with the photos you want to include. 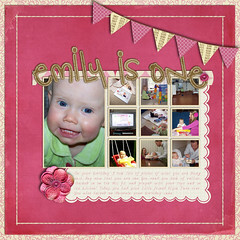 I used Erin Ink’s kit and templates to scrap these pages about our little girl. I used Flergs About a Boy Kit to scrap these pages, they coordinate with Edward’s first year album. Birthdays are for Grown Ups too! There’s no reason not to scrap your own birthday. For this pair of pages I emphasized a photo on each page. I used just the ‘money shot’ for my 27th birthday and paired it with Karen Lewis Designz template and kit. 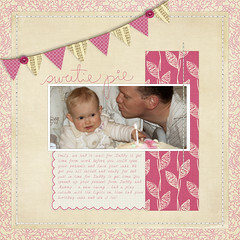 Credits: Karen Lewis Designz Life is Good kit and template. Though the pages vary in terms of journaling and number of photos you can see the same framework beneath them all. What is your go-to method for scrapping event pages? PS If you want to learn more about organizing your photos to make scrapping easier, you’ll want to join me for Get Organized: Photos. In five 15-minute sessions you can get a handle on your photos and set up a system that works for you!